After infertility breaks her heart – and ends her marriage – Krystal Parker heads back to her hometown in Arkansas, trying to recover and refocus. She’s supported by her longtime friend Corinne, who does have some news she hasn’t mentioned to Krystal – and she might find a new anchor in Corinne’s brother-in-law Jared. Some adoptive parents will resonate with Krystal’s infertility, and will also resonate with Krystal’s mixed feelings when she discovers that Corinne is pregnant. Krystal and Jared strike up a relationship. Jared works with youth, and one of the young women he works with has approached him – she is pregnant, and she asks him to find an adoptive family for her expected child. Krystal and Jared start their life together, and eventually adopt this child. In the midst of a very difficult season, Krystal finds support in her longtime friends. Krystal feels isolated in her infertility, and is surprised to find that others in her social circle also have experienced it. The film offers hope and some guidance to folks struggling with infertility and heartbreak – don’t let it stop you from living your life, and don’t let it keep you isolated. Have hope, because you can play a part in guiding your life, even if it has gone through seasons you wouldn’t have chosen. Jared and Krystal are open enough with their daughter’s adoption that they keep her birthname. The way in which the adoption is presented seems oversimplified and perhaps unrealistically quick and uncomplicated. 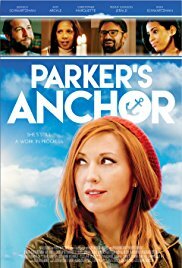 Parker’s Anchor is a charming story. It seems likely to be helpful as part of the pre-adoption process for people who are considering adoption after having struggled with infertility. A character tells Krystal that everything will work out – that what she’s going through is part of a bigger plan. It’s intended – and received – as helpful advice, and for some folks, it will be helpful. Others have expressed challenges with that belief as it pertains to adoption, and feel more comfortable with the belief that bad things happen that shouldn’t have happened, but good can be brought out of them. Does one of these views align more closely with your own viewpoint? Which is more helpful to you? What’s the value of the other viewpoint? If infertility has been a part of your journey towards adoption, how have you dealt with your feelings regarding the infertility? What level of openness would you be comfortable with in an adoption? Check out our book for more movie recommendations!